Which 3D printing filaments should be dried? ABS, PMMA, PA (Nylon), PC, PET, PETG, POM, TPU, advanced filaments like CF filled PA or flexible filaments should be dried before printing. We also recommend to feed preconditioned PLA or PP filaments, because it can improve the reliability of the printing process. What does determine the ability of a 3D printing filament to absorb moisture? It depends on the polarity of the main polymeric component, i.e. its chemical nature. Why do the undried filaments print so bad? The main negative effect of excessive moisture during processing of polymers is hydrolysis, i.e. the chemical breakdown of polymer macromolecules due to reaction with water at high temperatures. What impact does moisture have on 3D printing process? colour changes. Hydrolysis products often lead to the colour changes of the polymer. What impact does drying have on the quality of 3D printed parts? The main advantage of using dryers is that it will reduce the number of moisture-induced 3D printing defects. We have also observed that the parts printed with dried materials sometimes exhibit more accurate dimensions than the parts printed with undried material (see Figure below). So if the dimensional stability of your 3D printed parts is important, we strongly advise you to use a filament dryer. In general, the use of dryers increases the overall 3D printing success rate, and makes the 3D printing process more stable, thus, even enabling a continuous 3D printing. 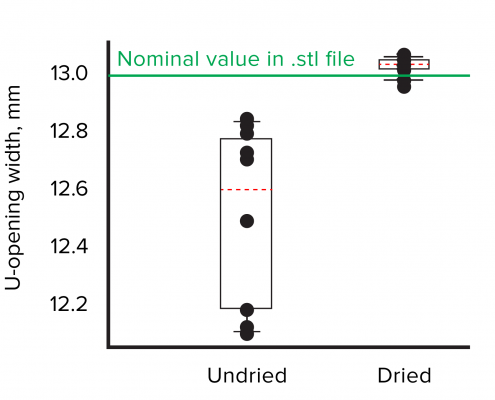 Figure: Drying effect on the dimensional stability of the printed parts: boxplot shows the U-shaped opening width of the spanners we printed using dried and undried PC filament (1.75 mm, natural colour). The width of the U-shaped opening in the parts printed with the dried material shows a much narrower value spread, and is much closer to the nominal value of 13 mm. The material was dried in Mass Portal FD1 dryer at 65 ℃ for 3.5 h with 20 % airflow, printed in Mass Portal Pharaoh XD at 270 ℃ (extruder), 90 ℃ (printbed), nozzle diameter 0.4 mm using the same g-code for dried/undried filament. The undried filament was used after a prolonged exposure to the ambient conditions (room temperature, RH = 55-60 %). How long does it take to dry a filament? On average it will take around 5 h at 60 – 80 ℃ to dry a 1 kg filament spool, depending on the specific type of filament and the initial moisture content. Note that drying settings can vary largely even for nominally the same filaments coming from different manufacturers. Why does filament drying take so long? Moisture will not start to migrate out of the material until the temperature gradient across the filament is gone. As polymers are bad thermal conductors, it takes time for heat to penetrate to the centre of filament. Moreover, it takes even more time for the moisture to migrate to the surface. Exactly how much time it will take, depends on a number of factors including the specific type of polymer and the drying temperature. How long does it take for a dried filament to regain moisture? Moisture regain times vary greatly from filament to filament, and storing conditions. For some hygroscopic 3D printing filament under extreme cases (e.g. at high relative humidity conditions and very slow printing speeds) the moisture regain may be too rapid to avoid moisture-related printing defects, some other filaments can even be printed days after drying. If the regain time is so short how can I be sure I will be able to print a bigger part? We have incorporated a feeding mode in our FD 1 dryers, to ensure feeding of a properly dried filament for an unlimited time. Moreover, our 3D printers have a continuous printing mode, so if you have two spools in two dryers, the sensor will detect when the first spool runs out of the filament, and the printer will start to feed the second spool automatically. Added to that, the filament is fed from the dryer into the printer through a closed shell tube to minimize the moisture uptake from the ambient atmosphere. What makes your filament dryers to stand out from similar products? HEPA and active carbon filters to limit the amount of exhausts and filter dust particles. What are the advantages of Mass Portal FD dryers? Being a compact device with a smaller footprint, Mass Portal FD dryers are easy to install. As no compressed air or chilling water is required, the dryers do not have any special installation requirements. I can dry my filament in my oven or fruit dryer. Why do I need your filament dryer? Of course, you can dry your filaments in an oven or fruit dryer, you just have to bear in mind that it is not a good idea to dry filaments in the same equipment where you cook your meal. Moreover, the rotating desiccant system makes our filament dryers more efficient than fruit dryers, and on average it takes twice as less time to dry the filament in our filament dryers than in a fruit dryer (see Figure below). Considering the generally long drying hours, it will result in significant time and money savings. The relative weight changes of 0.5 kg Nylon filament dried in fruit dryer (at the maximum temperature of 72 C, at full air flow) and in our Mass Portal filament dryer (at T = 70 C, air flow = 20 %). 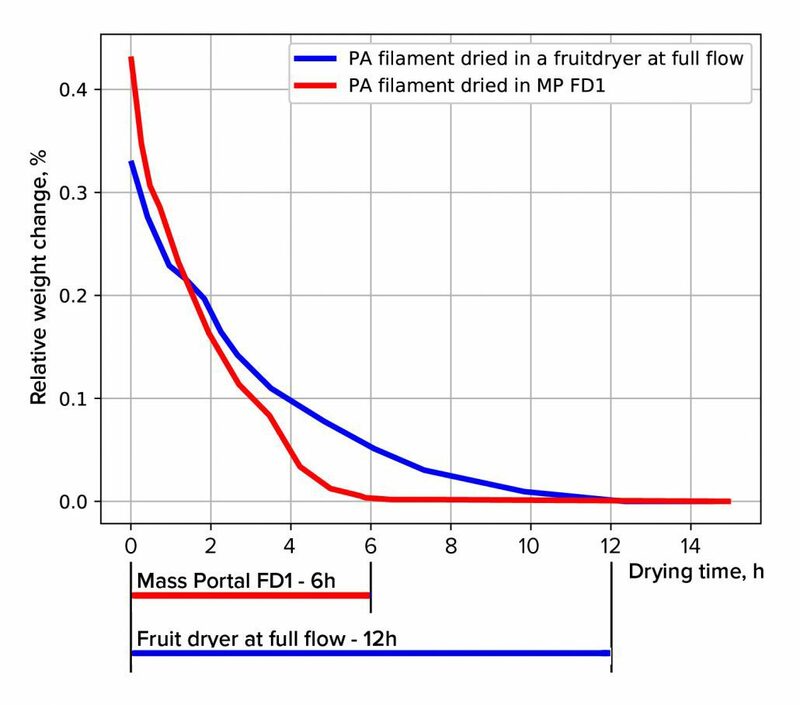 This graph shows that drying in the Mass Portal filament dryer is clearly faster and more efficient than drying in a fruit dryer. What are the main drying parameters? The main drying parameters are temperature, air flow velocity, and drying time. What drying parameters can be changed in Mass Portal FD1 dryers? In Mass Portal FD1 dryers the user has an option to control drying temperature, air flow velocity, and drying time. What about the absolute water content in the incoming air? Does it have an impact on drying process? The absolute water content in the incoming air is an important drying parameter, but there is no option to change it in the Mass Portal FD1 dryers. To reduce the moisture content in the incoming air, we use rotary desiccant discs, which are being continuously regenerated during the drying process. Our measurements show that ambient air with 55 % RH at 25 ℃ loses about a half of its water content when passing through a rotary desiccant disc. How do I know what drying settings to use? We are building a comprehensive database storing the drying (and printing) settings for different materials from leading 3D printing filament manufacturers. Our FD1 dryers and 3D printers can connect to the FabCloud database to search for and download the profiles of interest. We expect that along with the development of the market for filaments dryers, suppliers will give more detailed recommendations for the drying conditions. Why is the maximum drying temperature in Mass Portal FD 1 dryers limited to 80 ℃? The main reason for the temperature limit is the material of the filament spool. Many manufacturers spin their filaments on PS or ABS spools. Unfortunately, these materials are prone to losing their shape at the temperatures needed to dry the spun material. To our experience PC spool is the adequate spool material. Where do the generic settings come from? Are they valid for all the filaments? At present 3D printing filament producers’ and suppliers’ recommendations on how to dry their filaments are usually very scarce. Therefore, it is impossible for us to get information on the most efficient drying settings from the supplied material data sheets alone. Obviously finding the right settings by trial and error for all the filaments is out of a question. The generic settings are based on the typical temperatures used in the polymer industry, but considering all the additives producers put into 3D printing filaments the values should be rather seen as guide values, which can (and should) be adjusted if needed. Should I try to dry out my filament as dry as possible? Firstly, when you dry 3D printing filaments using air with the constant properties (constant temperature, relative air humidity, and airflow) the moisture content in the material will slowly approach the so-called equilibrium moisture content, and will not decrease any further (see Figure below). In other words, drying filament with drying air having a certain temperature, relative air humidity, and flowing velocity values will never result in a material with the moisture content below some equilibrium moisture content, no matter how long one dries the material. 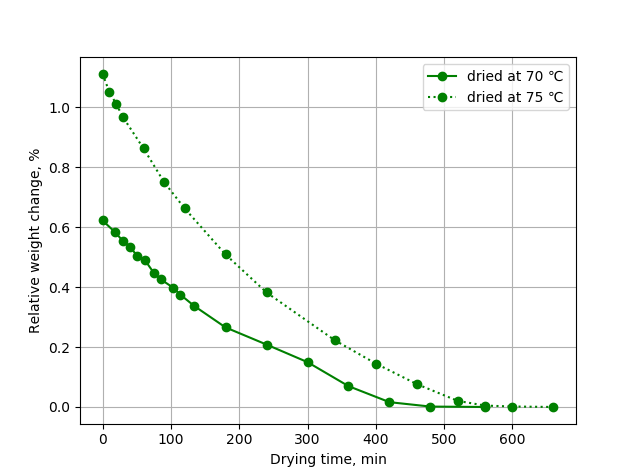 Figure: Drying curve for PA 3D printing filaments. The material was dried in Mass Portal FD1 dryer at 70 ℃ and 75 ℃, with 20 % airflow. The undried filament was used after a prolonged exposure to the ambient conditions (room temperature, RH = 55-60 %). Drying for 450 min @ 70 ℃ or for 550 min @ 75 ℃ is generally enough to dry the filament. Secondly, some cheap filament manufacturers put a lot of additives into the filaments. These additives tend to migrate out during prolonged exposure at high temperatures; this phenomenon might be called overdrying. Printing with an overdried 3D filament will not result in a good print. How does drying a filament influence the 3D printing settings? Generally, when printing with a properly dried filament you have to increase the printing temperature. Hot air dryers are often said to be incapable of removing enough water for proper processing of hygroscopic polymers. How adequate are Mass Portal FD1 dryers for drying 3D printing filaments? Indeed the drying power of hot air dryers is often not adequate to dry hygroscopic polymers. That is why we incorporated an rotary desiccant wheel to dehumidify the incoming air. This allows reducing the absolute humidity content in the incoming air by a factor of two before it gets into contact with the filament. This makes our dryer more efficient compared to drying in an oven or in a hot air fruit dryer. How does one operate the Mass Portal filament dryers? Mass Portal’s comprehensive embedded software has a number of features to set up, and edit your drying settings. Single click generic drying profiles are available for the most popular filament types and using the cloud-based FabCloud software you can access manufacturer-approved drying procedures. Of course, you can set up your own drying settings for a custom filament. How safe are Mass Portal FD dryers? Our filament dryers are the perfect solution when it comes to safety and user-friendliness: they are equipped with a built-in overcurrent, overheating protections, and door open/closed sensors. All our dryers possess a set of HEPA and active carbon filters that limit the amount of the harmful exhaust gases and prevent dust particle from entering the drying chamber. How often one has to replace the HEPA and active-carbon filters? Filters have to be replaced every 1000 h of dryer operation. Are Mass Portal filament dryers compatible with all 3D printing filaments? Mass Portal FD dryers are compatible with all open-materials 3D printing filaments. The maximum spool dimensions are: maximum diameter 200 mm, width 80 mm. Are Mass Portal filament dryers compatible with all 3D printing printers? In a standalone operation mode Mass Portal FD dryers are compatible with the most open-materials 3D printers which use standard filament sizes: 1.75 mm, 2.85 mm, 3.00 mm.